The first GLASS dataÂ arrived on 2013 December 24 and 30 and consists of 10029 and 3812 secondsÂ of G102 and G141 spectroscopy on MACS0717, respectively, and comprise only ~1/20th of the final GLASS data product. 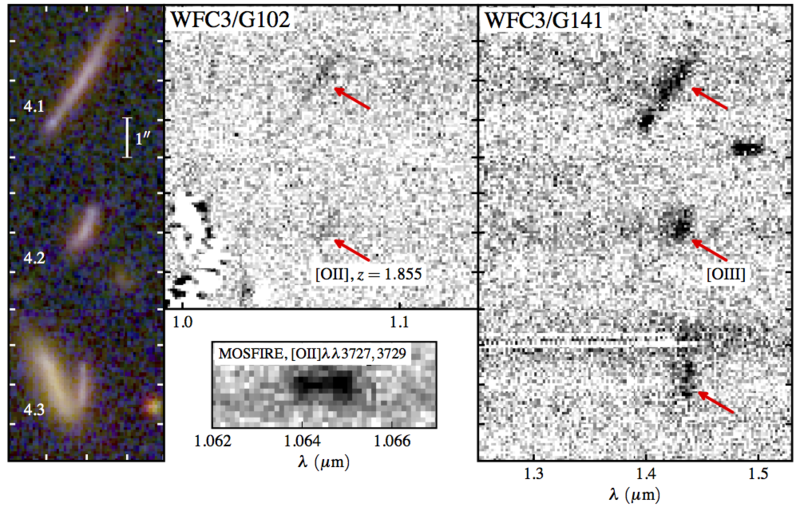 For the 9 redshiftÂ 6 galaxy candidates in MACS0717 with GLASS grism spectra clear of contamination we do not detect any emission lines down to aÂ 1Ïƒ noise level of âˆ¼5Ã—10âˆ’18 erg sâˆ’1 cmâˆ’2. This confirms that the targeted high redshift candidates are notÂ strong line emitters at lower redshift. For more details follow the link to ADSÂ . GLASS proposal selected for JWST Early Release Science program!